Advanced Distribution Solutions, Inc. (ADSI) is an industry-leading provider of order packing, dimensioning and multi-carrier shipping software systems for online retailers, distributors, manufacturers, 3PLs and others. Our flexible omni-channel order fulfillment solutions accelerate throughput while eliminating packing errors and controlling shipping costs. Multi-Carrier Shipping Software - Integrated with hundreds of carriers, our software allows you to compare carrier rates and time in transit while being able to process your shipment in seconds. Fast, Scan-Based Order Packing & Verification - Our order fulfillment software helps workers pack more in less time, while ensuring orders are accurately picked and packed before they are closed for shipment. Hardware Solutions - Get the best pricing and support in mobile computers, barcode scanners, printers, dimensioning systems and more. Stop by Booth S3674 for a free demo! Watch this video to see how you can reduce freight costs and automate your shipping process with ADSI's Ship-IT Multi-Carrier Shipping Software - compare carrier rates and services, print compliant documents and more! Are you looking for a faster, simpler way to calculate dimensional weights and shipping rates? 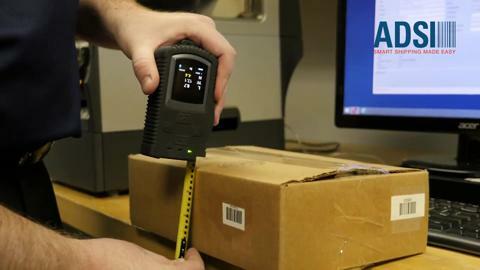 Watch this video to find out how ADSI's Size-IT mobile dimensional weight calculator can help.